Released on Nintendo Wii, My Pokémon Ranch WiiWare is mostly seen as a companion tool for Pokémon Diamond and Pokémon Pearl. Similarly to Pokémon Box for Ruby & Sapphire, the game lets the player transfer Pokémon from and to the fourth generation games, while offering the possibility to store a large number of Pokémon in the farm. The stored Pokémon will be displayed on the ranch in 3D models, each having their own animations and sounds. The player too, will have a 3D avatar (Mii) they would use to interact with the different Pokémon in there. Although the graphics aren't that great, the music is still enjoyable, and the various game features make the game an interesting choice. Although My Pokémon Ranch is considered a complimentary tool to Pokémon Diamond and Pokémon Pearl, it can be a standalone game that can still be played without having either of the two games. 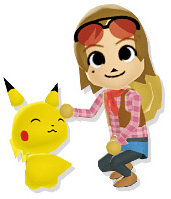 In fact, the ranch manager Hayley will gift the player six starter Pokémon, and offer them a new different one on a daily basis. She will ask the player each day the type of Pokémon she should bring the next day. Additionally, she's also willing to trade some of the Pokémon in her possession (including both legendaries Mew and Phione) for specific ones. Last but not least, Hayley does also give very useful information about the Pokémon that is different to the Diamond and Pearl entries, since she helps locating these Pokémon on the Sinnoh region map. 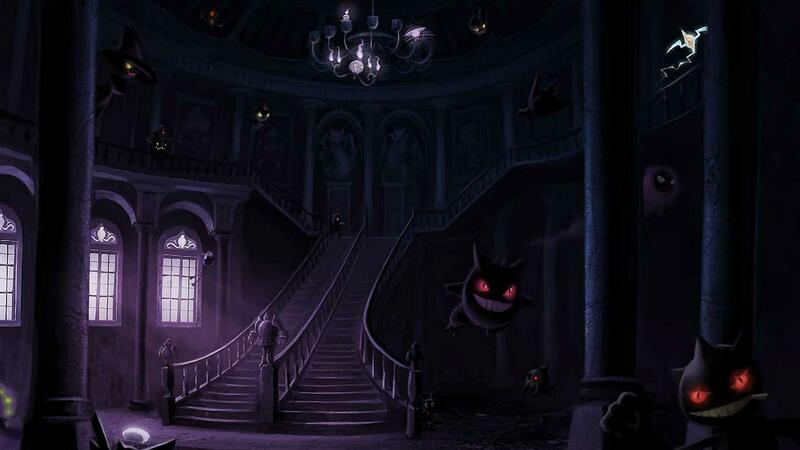 The game received an update to enable its interaction with Pokémon Platinum in 2008, adding new features to the game. The update was sadly released in Japan only. The game takes mainly place on a large farm, with no relevant location in the Pokémon world. It is composed of a wide grassy green land, surrounded with a white fence. The farm also contains a barn, and is managed by Hayley. There are many different characters within the game, but the most important of all would be Hayley. All the characters, though, appear appear as Miis created through the Wii's avatar system. Hayley: She's the host of My Pokémon Ranch. The region Hayley comes from is unknown, but presumed mostly to be Sinnoh as she seems to have a good knowledge of where Pokémon can be found across that region. All we know about her, is that she's a friend of Bebe (The inventor of Sinnoh's storage system). 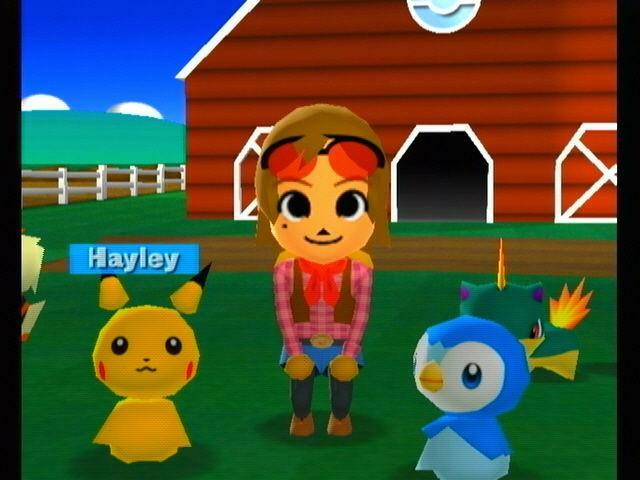 Hayley is a devoted Pokémon breeder and yearns to create the biggest ranch in the world. To do so, she requires the player's help, to collect Pokémon and data on them. 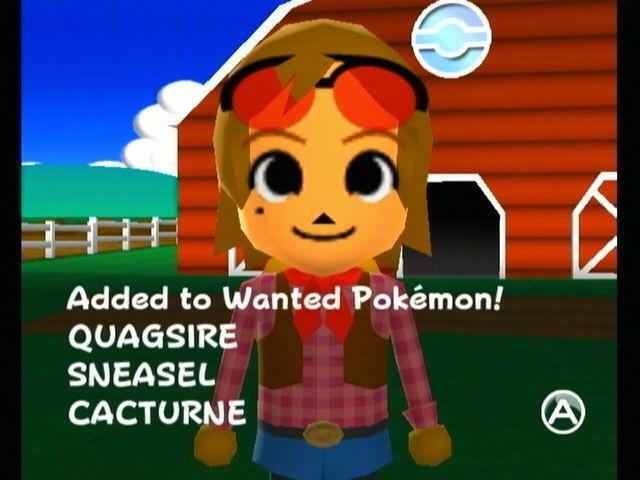 Within the game, she takes care of the player's Pokémon, brings a new one to the ranch each day and trades her own. The Player: The player's character is a custom made Mii, created with Wii's Mii avatar system. There are different facial traits available for selection, enabling the player to have a unique character. Club Look-See Miis : They are mainly secondary characters that appear on the player's ranch and invite them to visit theirs. What's special about them, is that they look similar to the Pokémon they raise and their ranches have specific themes. Each person has number and they appear in a linear order following these numbers. 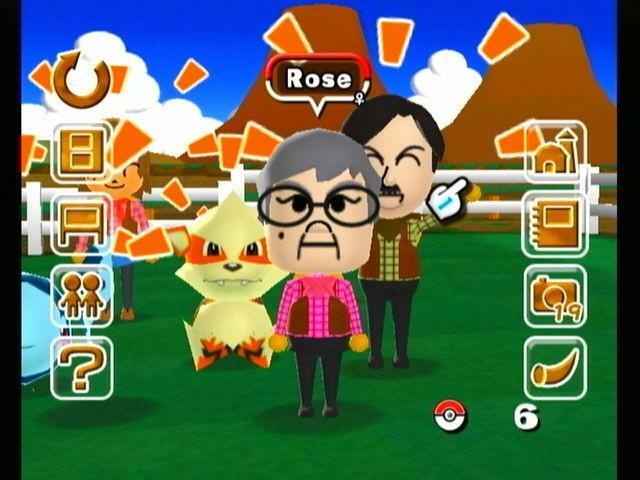 Mii's and Pokémon Interactions: Using their Miis(the custom created character), the player can interact with the environment and the Pokémon present in it. They can run away from Pokémon or even dance with them, as they can interact with the farm by tending to it and adding decorative items. The Pokémon too interact in between themselves by greeting or attacking each others. Screenshots: Pictures can be taken at any given moment in the game. The Focus Lock of the camera helps taking better images of Pokémon and objects, as the camera angle can also be rotated at the player's will. Additionally, the player can share these pictures with their friends, using the WiiConnect24. Some Mii's (left), A Mii interacting with Piplup and Pikachu (right). My Pokémon Ranch actually features a ranch level system. In order to gain a level and expand your ranch, some requirements are to be met. Passing certain levels adds new stuff to the game. Trade Hayley one of the Pokemon on her wanted list, and you'll get one of hers in return. Within the ranch several events happen, making the farm lively and seemingly more realistic and fun. These events can be devised into Random events that occur every 15 minutes and specific ones that happen after reaching a certain condition. Random Events: They are mainly interactions in between Pokémon. The Pokémon would be greeting or attacking each others. The attacks used by the Pokémon will depend on their type, and will be generic attacks like a fire Pokémon breathing fire or an electric Pokémon electrocuting another. 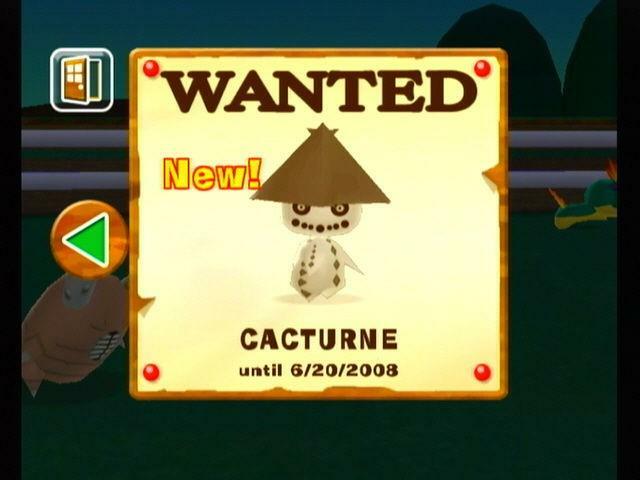 Throughout the game, various toys will be delivered to the Toy Box on a daily basis. 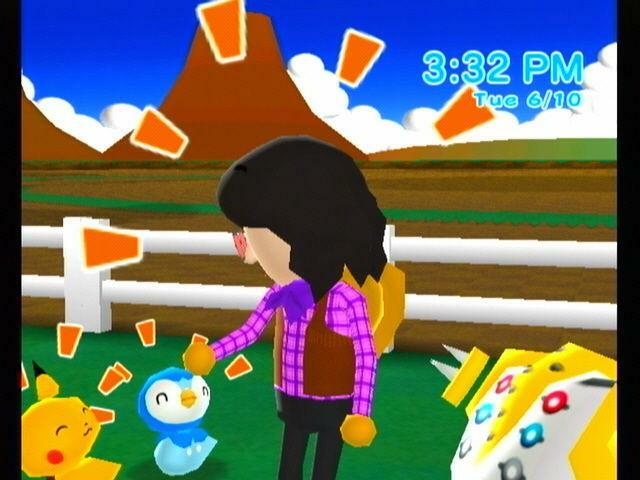 Toys can be placed on the ranch, so that Pokémon and Mii's can interact with them. Training Bag A training bag on which Pokémon can practice their attacks. Stinky Ball A ball that releases a stench repelling both Pokémon and Miis from the Mii that picks it up. The Mii carrying it gets anxious and ends up throwing it away. Spring Stand It lets Pokémon jump very high. Spin Ride If a Mii or Pokémon step on it, they'll spin quickly. When spinning, some Miis get confused. Snowman A snowman that freezes all Miis and Pokémon nearby. Pokémon vulnerable to Ice attacks do not approach it. 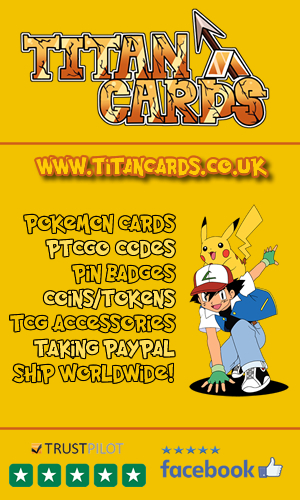 It is vulnerable to Fire type attacks and depletes with time. Slippery Peel It trips Miis and Pokémon that step on it. Round Rock A rock that moves by when attacked by Pokémon. If a Pokémon fails to avoid it, it gets flattened to the grass. 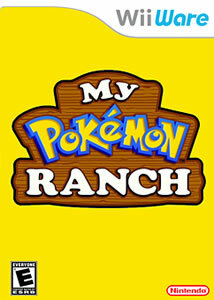 Pokémon Pallet It gathers all the ranch's Pokémon, forming the image of the player's Mii. Poké Rocket A cannon that launches Pokémon far away. Poké Microphone Pokémon can cry through the microphone, resulting in their voices being heard in the Wii Remot's Speaker. Poké Cushion It can be placed on a Mii's head and Pokémon tend to jump on it. If the Pokémon is too heavy, the Mii will be unable to move. Poké Bell If a Mii uses it, it will attract Pokémon toward it. Poké Balloons If attached to a Pokémon or a Mii, it will let them fly away. Pitfall A small hole in which Pokémon and Miis can fall. After they jump into it, they'll reappear falling from the sky. If the Pokémon is too big, like Onyx, it won't fall. Fountain Can be used by both Miis and Pokémon. Fire Pokémon avoid it. Challenger A dummy toy that trains Pokémon by attacking them. Avoiding the attack will result in the toy starting a sort of celebration. Burst Ball An explosive ball that detonates upon contact. Bounce Back Ball A super bouncing ball that throws away any Miis or Pokémon it contacts. The faster the ball, the further the victims are thrown away. Bonfire Both Pokémon and Miis can watch it, although it sometimes burns some Pokémon. Water Pokémon can douse the flames a bit. Attractor A weird device that attracts Pokémon to the Miis that use it. Raising the ranch level to 26, which allows storing up to 1500 Pokémon. Eleven new toys with new fun mechanics. Three new Club Look See members along their ranches. Battle between Dialga and Palkia. Water Pokémon using Surf on the water, all while swimming and jumping. Check out these videos from My Pokémon Ranch including Japanese and Western trailers + the first episode of a decent Lets Play. The USA Trailer for My Pokémon Ranch, gives a good overview of the game. Join Trey on a relaxing getaway as he runs his very own Pokémon Ranch in this Lets Play episode. Level 100 Pokémon or Pokémon found in special places will emit sparkles in blue or green respectively or both if the Pokémon obeys both conditions. Everyone's Pokémon Ranch was the original game title, but it was changed due to the fact that western cultures are culturally more individual oriented. Certain Pokémon have unique specie characteristics like the Weezing emitting stinky yellow gaz that repels other Pokémon. No official Sales numbers are released about My Pokémon Ranch, but one thing for sure: The game was one of the worst recieved Pokémon titles to be released and probably had poor sales as a result of it. Craig Harris from IGN was really annoyed by the Miis Character models refering to the game as "the ugliest Pokémon game -- to hit any videogame system" and rated it 4/10 the equivalent of "Bad" on their scale. Alex Knox from NintendoLife, also, thought that the game missed a lot of potential and could've been way better if more effort was invested in it. He rated it 4/10, which equates "Poor" on NintendoLife's scale. On GameRankings too, My Pokémon Ranch was also given a bad score of 43.11%.